On Thursday, April 19th, Fantasy Faire will open for 2018, and run through until Sunday, April 29th. Through the event, there will be a lot to see and do – as there always is at Fantasy Faire – including the fourth annual Literary Festival (LitFest). Tom Lloyd, novelist and author of the five-book series Twilight Reign. He’ll be attending the LitFest on Thursday, April 24th. Danie Ware, perhaps most noted for her Ecko series. She’ll be attending the LitFest on Thursday, April 26th. Both will be in conversation with David Abbott. In addition, there will be stories and discussions with a host of writers who have particular relationships with Second Life. This year the festival will again be emphasising creation, as a number of the leaders of creative writing groups in Second Life bring their regular events to the Faire, and welcome newcomers who want to join in with such events. There will also be a special daily story and poetry writing challenge. Every day, those at the festival will be invited to put their Fantasy Faire experience into words. The Faire is brimming with stories: breathtaking builds and fantastical creations designed to touch your heart and soul. What stories do they inspire in you? Details of all the LitFest events will be posted in the LitFest schedule in the next few days. Each LitFest features the works of a particular author. In 2015, it was Terry Pratchett, who sadly passed away just before the event. In 2016, and to mark the 400th anniversary of his death, the LitFest featured William Shakespeare. In 2017, the LitFest honoured the life and works of John Ronald Reuel Tolkien. For 2018, the life and works of novelist and short-story George Raymond Richard Martin, the power behind A Song of Ice and Fire, also known as Game of Thrones. Martin’s work will be celebrated on Wednesday, April 25th, 2018 with a series of events. 09:30–10:30 SLT: The World of Ice and Fire – Freyja Nemeth & Ran Garrigus: Linda Antonsson and Elio M. García are the owners of Westeros.org, the oldest A Song of Ice and Fire fan site. They are also the co-authors of The World of Ice and Fire with George R.R. Martin. 11:00–13:00 SLT: Game of Thrones Party with DJ Vasa Vella. 19:00–20:00 SlT: A Selected View – George R.R. Martin with Seanchai Library: Aoife Lorefield presents a different glimpse of the popular author, beyond the fire and ice, to other selected works, presented live in voice. 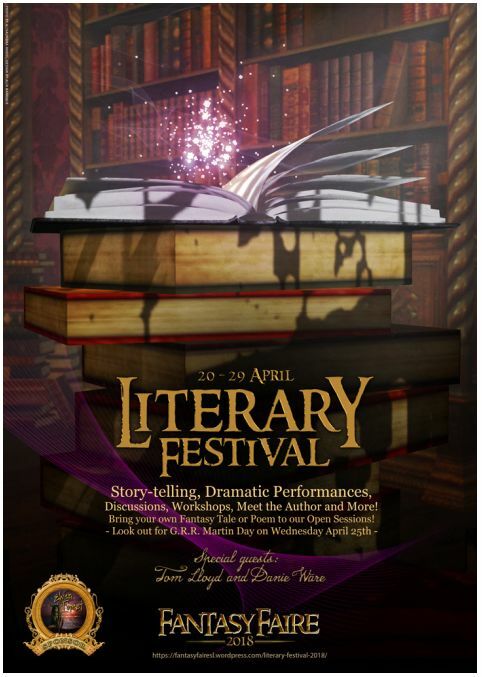 The popular Fantasy Faire LitFest Tours will once again be taking place, leaving daily from the LitFest home base on Halls of Story to explore the Fairelands and seeking the stories they have to tell as well as their special secret places and details. Each tour will be guided and accompanied by music, as some of the Faire’s best loved DJs offer selections of music, especially chosen for each of the regions visited. Keep up with all the news and information on the LitFFest and Fantasy Faire through the Fantasy Faire website.